This project involved the extensive renovation of a four story town house, previously divided into four apartments, reconfiguring the building into a two family residence. The clients, a cabinet maker and a jeweler, would live on the top three floors, renting out the garden level apartment. These photos are of the work in process, as the majority of the finish woodworking is still in process. The main floor, seen in process at right, was completely opened up - removing the typical division between kitchen and parlor, opening the parlor onto the stair by installing a new steel beam, and also enlarging the openings in the south facing exterior wall. The bedroom floors were also reconfigured. The master bedroom was re-proportioned to create a walk - in closet and a small room which would initially be the babys room and eventually an office. 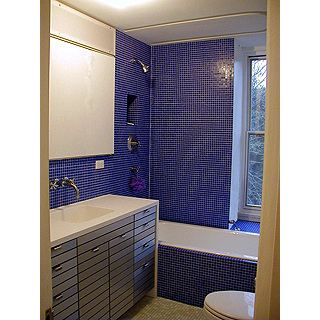 In order to bring more light into the master bedroom translucent panels were inserted into the bedroom-bathroom wall.